...And the RAIDERS win!!! They beat the Chargers!!! Raiders finally get past the 5 game win...up to 6...need to win the next few to maybe make it to the playoffs. Yep, lotta peeps singing the blues in San Diego after the Raider game. The Bengals are on a streak! Perhaps it is a good thing I don't have TV cable service and haven't seen a Bengal game for years. Seeing the scores is bad enough. And the BCS is set...not really a fan of Auburn or Oregon...but since I used to live in Oregon will be a Duck fan in January. 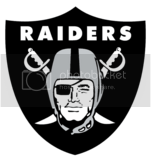 Oakland Raiders taking on the Denver Donkeys on Sunday...GO RAIDERS!!! oh no! don't remind me. They hog the tv and eat all the best snacks! So now the NFC and AFC games are set...Nice win by the NY Jets, the Pats couldn't hang...and Da Bears whupped ole Seahawks into submission...and Packers? Nice win against the Falcons. And glad the Ravens got trounced by the Steelers. I'm going to go for the Steelers- no one get mad at me its just a game remember lol! Nice win Green Bay...shutting up the Steelers fans was good...and at least the Cryboys and Pats weren't there either. My husband's world is about to crash..his beloved Saskatchewan Roughriders have lost Andy Fantuz to the Chicago Bears. All I'm asking is what the heck do I do with all the Fantuz Flakes boxes we have in the pantry?